Islamic State fighters have admitted that Kurdish forces managed to retake Kobani after the intensified US-led air campaign forced the jihadists to abandon position in the strategic city near the Syrian-Turkish border. In a recently released ISIS video, two militant fighters say that continued aerial bombardment by fighter jets from the US and some of its Arab allies forced them to retreat, although ferocious and heroic resistance from Kurdish forces defending the town was another key reason why they were forced into retreat. “The warplanes were bombarding us night and day. They bombarded everything, even motorcycles,” said one of the fighters. The warplanes “destroyed everything, so we had to withdraw and the rats advanced,” said another. Earlier this week, Kurdish officials said the town was almost cleared of ISIS fighters. “Kurdish ground forces, supported by our air component, were successful in retaking the town of Kobani,” stated US Lieutenant-General James Terry, confirming the retreat of Islamic State fighters. Their failure to hold onto Kobani is a major blow to the Islamic State, which lost around 1,000 fighters. The militant group has, however, vowed to attack the town again and defeat the main Kurdish militia in Syria, the YPG. In a separate development, Iraqi Kurdish forces and police have retaken from ISIS an oil field in Kirkuk, located in the north of the country, along with eight surrounding villages. They also freed 24 oil workers who had been captured by ISIS fighters. ISIS began its initial offensive on Kobani in mid-September after capturing more than 300 towns and villages in the area. More than 200,000 Kurdish residents have been forced to flee their homes, with most of them heading across the border to Turkey. The US, along with its Arab allies, began an air campaign against ISIS in Syria on September 23. The airstrikes aimed to push back the jihadist forces after they took over about a third of Iraq and Syria over the summer. However, this has still not happened and most of the territory ISIS seized still remains under its control. 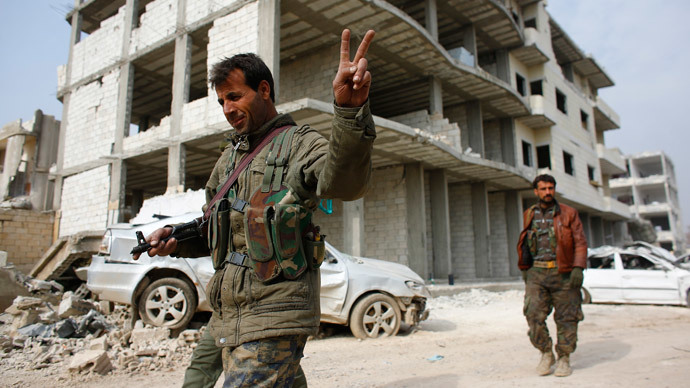 In the case of Kobani, a combination of stiff Kurdish resistance and airstrikes forced them to abandon it. Although Kobani is liberated of ISIS, Turkish troops are still blocking the border to stop residents from returning until the town is safe. However, with the town in ruins, it is not clear whether anyone wants to return. Meanwhile, last Sunday, the Turkish disaster and emergency management authority opened its largest refugee camp so far, which will house up to 35,000 refugees from Kobani. “They tell us Kobani does not exist anymore. We do not know how long we will be staying here,” Adila Hassan, a 33-year-old mother living in the camp, told AFP. "We will return once the town is rebuilt. That’s not going to happen soon."